I’ve just returned from Universal Studios in Orlando, Florida, and will be doing a series of posts on my experiences in Harry Potter World. I’m a big fan… and the park had a lot to live up to… I’ll try not to give too much away for those of you who haven’t journeyed to the Wizarding World of Harry Potter. But hopefully my posts will either bring back memories of your own trip or entice you to travel there yourself! The Three Broomsticks was actually one of my unexpected favorite parts of the day. It was well-organized, reasonably priced, tasty, and we got to sit down and relax. And do not be dismayed if you look in and see there aren’t empty tables. The place is big, and they have people who’s job it is to show you to a table. If the wait time isn’t too bad, I definitely recommend it! There’s a line to get in outside, but that went pretty quickly. Inside you stand in another line that takes you past a window that displays the food options and a TV screen menu. The menu is mostly British dishes like fish & chips, shepherd’s pie, etc. Most meals come with a fresh garden salad. 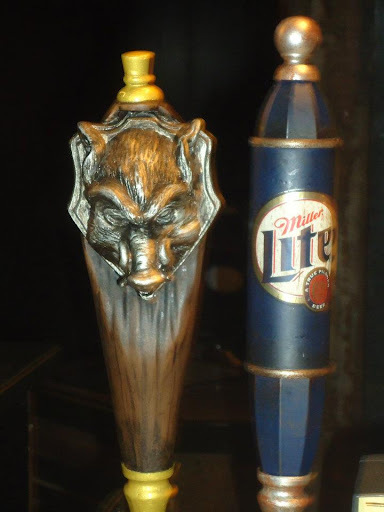 You can also order wizarding drinks like butterbeer, pumpkin juice, or the special Hogshead brew (alcoholic beverage). And a funny story: My brother wanted to try the Hogshead brew instead of butterbeer because he’s the big beer drinker in the family. He ordered one at the register and they carded him, but then when we got our food/drinks… there was no beer. He told the guy who showed us to our table that he didn’t get his beer, and the guy checked out the receipt. Turns out, the girl at the register didn’t ring up the Hogshead beer. But the guy was like, “No problem, man. I’ll get you one.” My brother ended up getting a FREE Hogshead beer. If you’re curious what Hogshead tastes like, my brother said it reminded him of Yuengling. The inside–I loved the mismatched chairs and brooms everywhere. 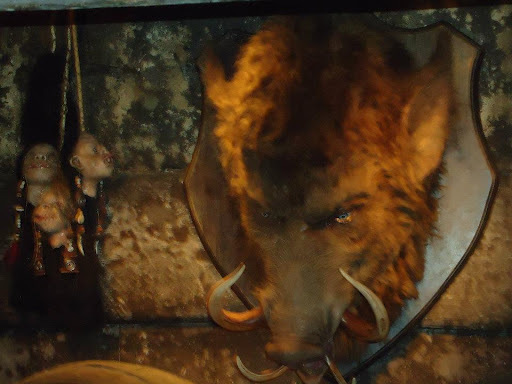 If you watch the Hogshead by the bar… he moves! Look what they have on draft! I really wish there was some sort of Great Hall show/attraction. I want to sit at one of the house tables. I want to look up and see floating candles. I want to see the ceiling that is bewitched to look like the sky. The Great Hall is definitely one of the most important settings in Hogwarts, and I want to experience it. The natural attraction/show to have in Hogwarts’ Great Hall is a Sorting Ceremony. I think this would be a great opportunity to add an attraction for younger kids. The audience could be seated at the tables in the Great Hall. Children (or adults) could be picked out ahead of time to be part of the Sorting Ceremony. There could be animatronic or screen projections of the professors. The audience could watch and applaud as the Sorting Hat chooses houses for members of the audience, and then the show could end with a sing-a-long to the Hogwarts School Song. How wonderful and fun does that sound? 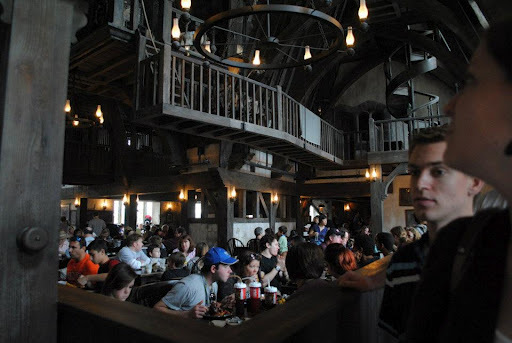 Did you see the house elves in the Three Broomsticks?One of the issues I had here was I didn't realize you had to order at the cash registers XD So me and my dad got in line at one of the serving lines, but we figured it out before we got to the front, thank goodness. I did not see the house elves!!! Where were they?!?! How could someone not have a good time? 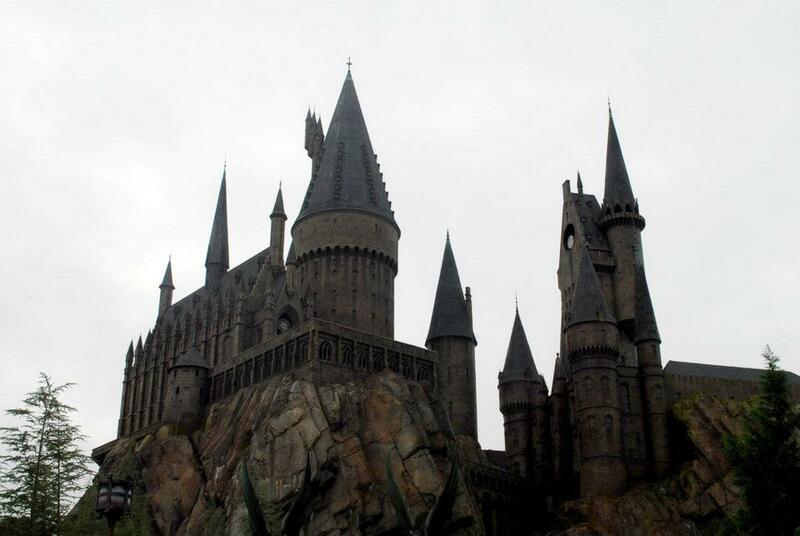 It's freaking Harry Potter World! It was really just their shadows up in this little rafter/balcony area at the top of the Three Broomsticks. Every once and awhile you could hear them banging and see their shadows. 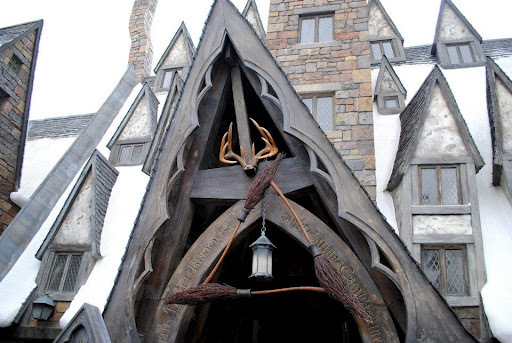 Dang, I would LOVE to sit and have a butterbeer at The Three Broomsticks! Yea! Glad you'd want to go to a Sorting Ceremony too!The Butterbeer is soooooo delicious. One of my favorite things from the trip!Hope your busy weekend was a fun one too! It really was one of those perfect moments. All I needed was to pretend Harry was next to me under his invisibility cloak, and BAM I would have been right in the story! Agh! You're super observant! I want to go back!!! My table just happened to be right next to it. I didn't see the Hog's head move!